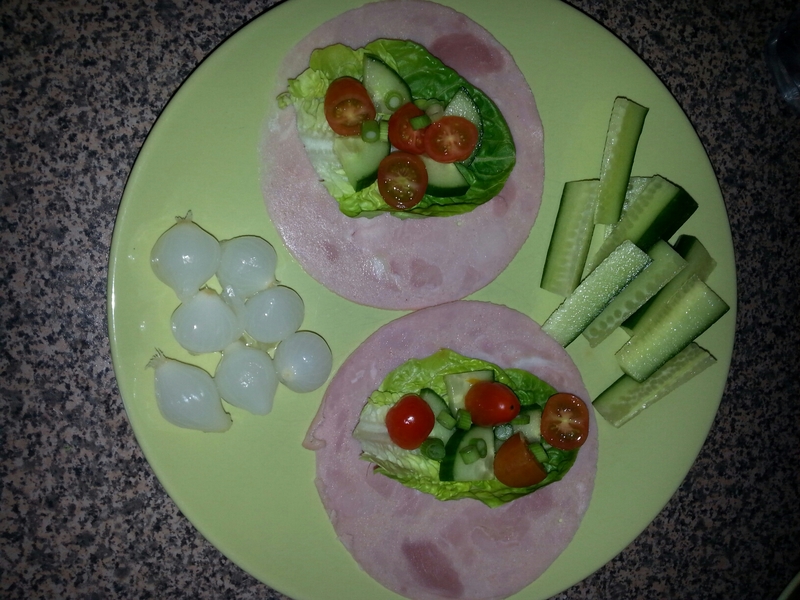 I have some pictures of some of my meals so far through my Slimming World journey. Hopefully give a few of you some new ideas. Simple, easy and quick to make. Chop up the vegetablez you are wanting to use. In mine I used peppers, broccoli, green beans and onions. Spray the frying pan/wok with fry light (I also put some garlic and herb salt in) once warmed up on high heat add your vegetables. 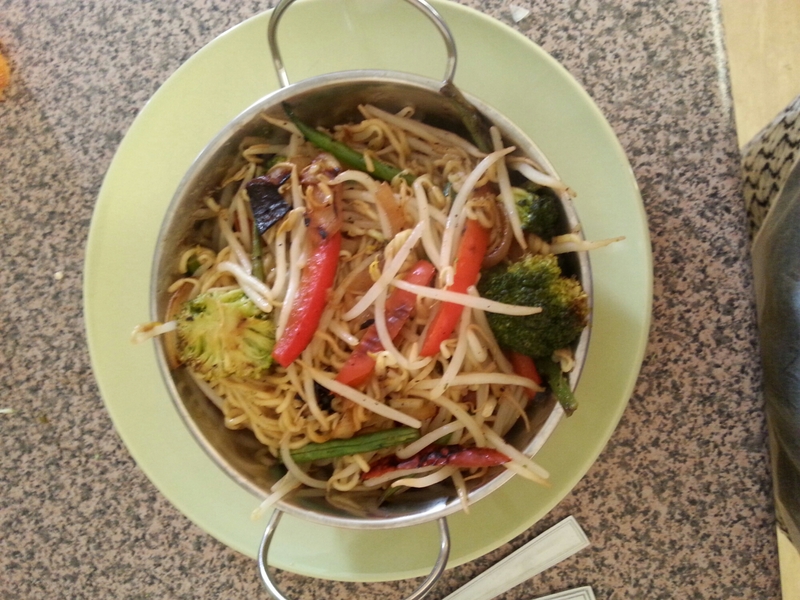 While these are cooking make your supernoodles as normal (low fat, free syns). Once supernoodles are nearly done pour them into the pan of vegetables and stir. At this point I added bean sprouts and kept on heat for 2-3minutes. Then serve and enjoy a syn free meal. This is pretty simple and self explanatory. I used lighter than light mayonnaise and synned this accordingly. Everything else syn free to eat. 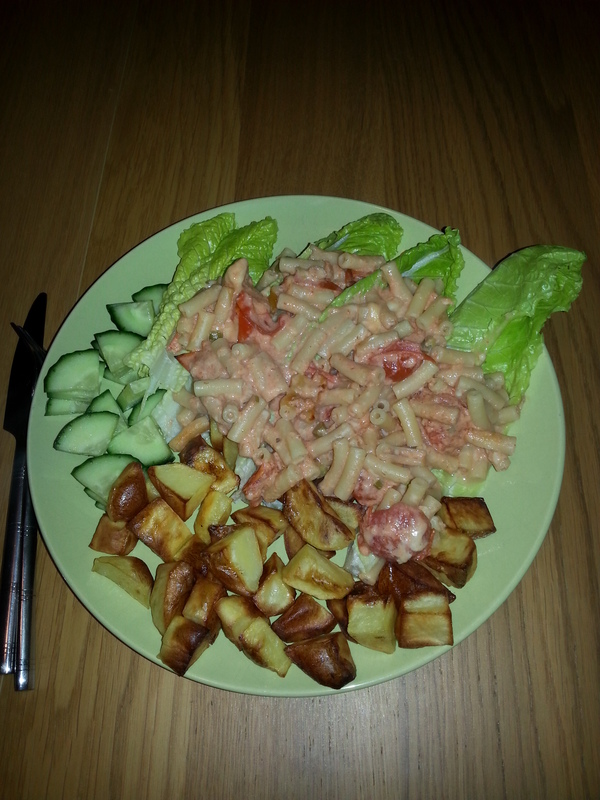 One of my favorite meals and seems wrong that it is syn free as it is so lovely. Spray pan with frylight and add either 2 cloves of garlic or 2 tbsp garlic puree (use more if wanted). Add in the pork mince and cook until browned. Drain any excess fat. 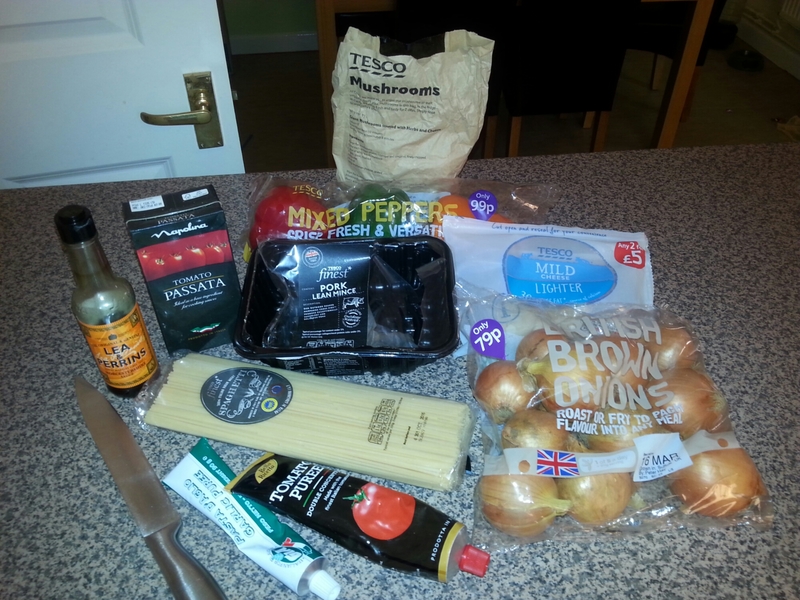 Add in chopped onions, peppers, mushrooms, 500g passata, 2tsp Worcester sauce and 2-3 tbsp of tomato puree. Cover the pan and cook for 2 hours on low heat. Stirring every so often. Boil some water in a big pan and add the spaghetti. Once cooked serve the spaghetti and spoon the sauce over the pasta and finish with a sprinkle of some cheese within your healthy extra A or syn it. This is so tasty. Love this for dinner. 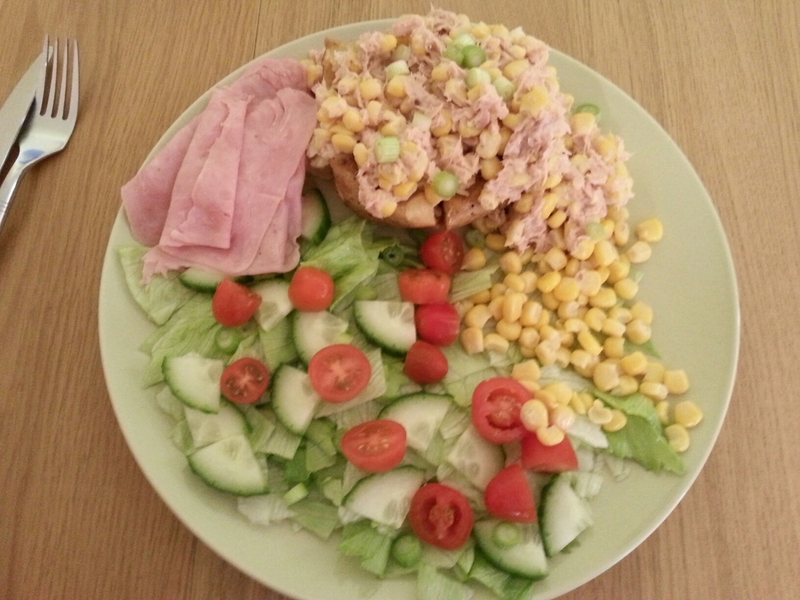 Lay down some syn free ham on the plate. 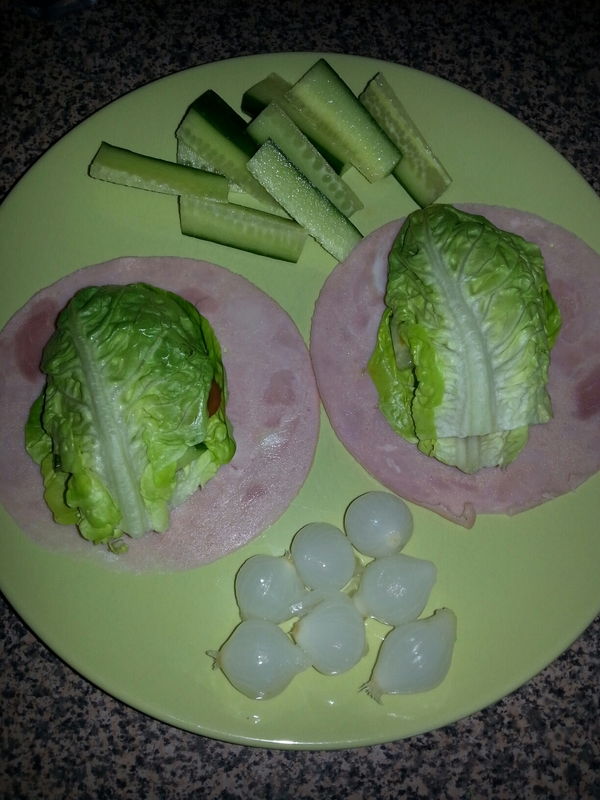 Place some little gem lettuce on the ham and put some tomatoes, cucumber and spring onions on top. Cover with another leaf of little gem lettuce and wrap the ham around it. Add some more syn free food to the plate. I used pickled onions and cucumber sticks. I was quite disappointed when I had finished eating this and ended up making more. I will hopefully put a few more posts of food ideas in the next couple of days. I am on week 8 or 9 now of Slimming World. This is the longest i have lasted on a ‘diet.’ So far i have lost 9lb and have another 1 stone 1 lb to target. It’s coming off slowly, but i can’t stop my ‘treats’ completely and i feel this is what is holding me back losing more quicker, but i am happy, i am eating cake, eating meals out (not as often) but at the same time i am eating healthier. Meals from scratch, much more fruit and vegetables in my meals. I find myself going to the fruit bowl without thinking. I never knew how much i liked plums and raspberries until i started this. I have started running this week (well walking/jogging, looking like a beetroot!) My legs are painful and takes me time to walk if i have sat down for a while. Would hate to see how i am walking! With this i am also doing some planks, crunches and squats when i remember and have time. I fit myself into some jeans this week that i haven’t been able to fasten for the past 1/2years yahooo! I am hopefully going to get the time to update my blog with some Slimming World meals we all enjoy eating, there are a fair few so far, and still have many more recipes to try! So today was my first weigh in, after being on Slimming World a week. I was dreading the scales, i was good and followed plan apart from the weekend! I am so glad weigh in is Wednesday and not Mondays. We had a bit of a hectic weekend and we needed food. In a city we didn’t know and all we could see was Mcdonalds! So i had a very naughty dinner, but it tasted delicious! With this in mind and also the fact i had a fair few double vodkas and diet cokes on Friday night, it didn’t really look good for my first week! Stepped slowly on the scales watching it get to a stand still. A big grin arrived on my face when i saw the weight, wahoo. The Mcdonalds didn’t stop me losing. Now onto week 2 and we have Jessicas birthday which means a little tea party on Saturday, and i whole lot of syns! Hopefully i will lose still if i maybe try a few SP extra easy days. So all is good on the weight front, can’t believe how much fruit and veg i eat now and actually enjoy it! Hello 2015, hello healthier me! Not been posted in a while, we have had a December move, so has been a bit hectic. Firstly Happy New Year everyone! Hope 2015 is a great year for you all. So new year means another New Years resolution. I think most of mine have failed over the years, but this year i am going to stick with it! I joined Slimming World on Wednesday, and learnt the scales aren’t that nice on your first visit! It was scary getting on the scales, but first time out the way and i will never be seeing that weight again or more hopefully! I’m not doing too bad so far, day 2 and i am getting it, i think, quite well. First day i forgot my heb a & b and i keep forgetting that i need atleast 5 syns a day, as i am getting under that for the first 2 days. 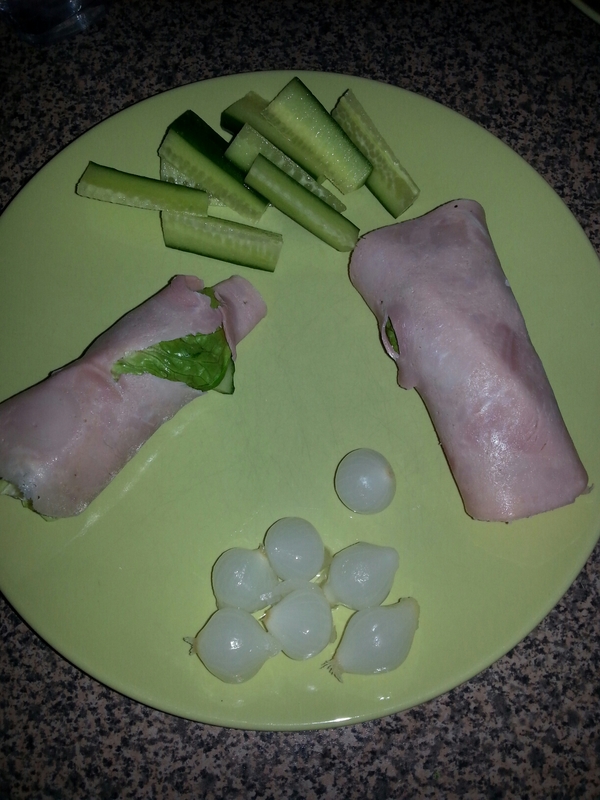 Todays meals were yummy and nothing like being on a healthy eating plan. I struggled to go in the fridge and pick fruit over chocolate. We have a huge pile of chocolate still from Xmas and i have been resisting the chocolate for fruit, although i had some chocolate for my afters after tea today it was only 1 syn and tasted, so good! Through my journey to getting healthy and toned i will be writing a few blog posts and you may see alot of pictures of my food and some recipes if you would like them. Breakfast i had some fruit no photos for that. 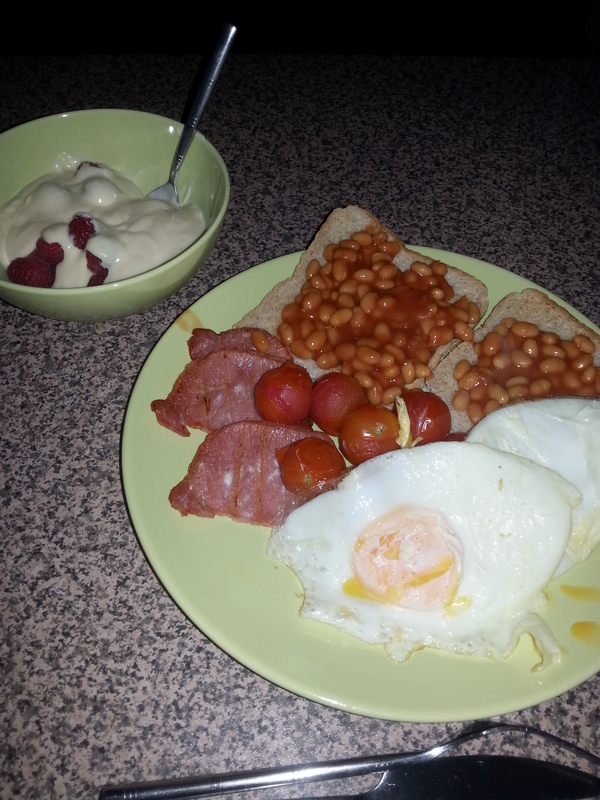 Dinner i had a fry up syn free using bread as heb b, with raspberries and muller light yoghurt. For tea i had SW mac n cheese (really tasty!) on top of lettuce with cucumber and homemade potato cubes. 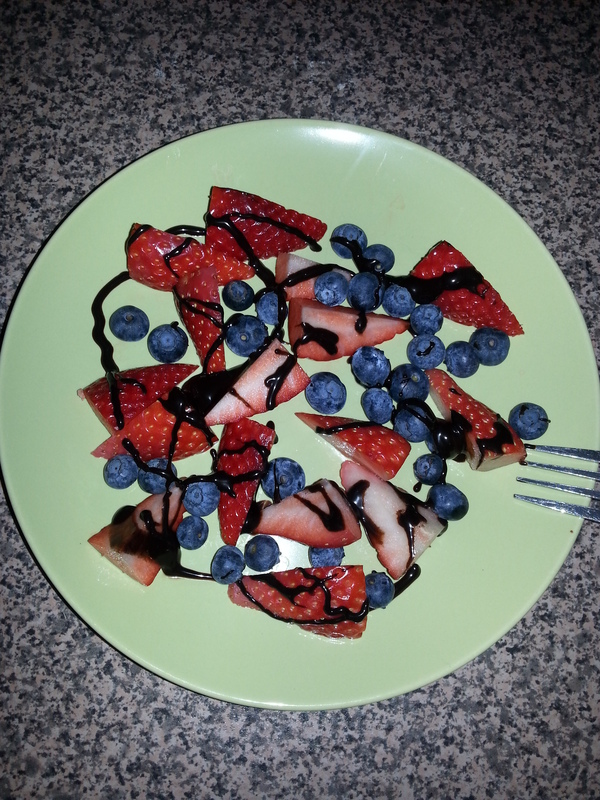 Dessert was strawberries and blueberries with some squirty chocolate which was 1 syn. You can eat so much on Slimming World! Fingers crossed next Wednesday i get a loss! I am getting into the gym again after having a week or 2 off it for personal reasons. I can see how my fitness has improved from when i joined. I also have a personal training programme for helping my key areas (tone my thighs, bum, hips, stomach) The weight loss is slow, but i doubt the chocolate munchies and crisp munchies have helped that, oops! I was at the gym on Monday and i had another Lynsey moment. I came off the running machine and went to get the cleaning stuff to clean it, clean the running machine and wonder why the woman next to me seems so close when i was cleaning to being on it. It then clicks in….Hmm where are my headphones and water bottle, look right. Oh yes, i was on that running machine not this one i have just finished cleaning. Now normally i would pretend i was meant to do this, but why on earth would i clean a machine that i wasn’t on and leave mine not being cleaned? I wouldn’t, so instead i muttered a few things to myself, got the cleaning stuff again and cleaned the running machine I was on. I’m sure the woman on the running machine noticed what i had done, the machines are very close together. Went to the gym Tuesday (yesterday) and made sure whenever i cleaned something i had been on it was the one i had been using. Sadly said goodbye to the Stokke Scoot last week. It was a great toddler pushchair, but it was rarely used and for the money it just wasn’t worth keeping. I haven’t used a pushchair for nearly 2 months with Jess. I couldn’t leave pushchairs just there though, and have bought 2 others (oops yes 2 in a matter of days, ahh) for long trips out or if i may one day decide to walk to school to pick the kids (too far for Jessicas little legs and with needing to be past a 60mph road there is no way i would trust her on her bike or scooter!). I bought a Maclaren Volo (2nd hand) but i just couldn’t get on with it, have washed the covers be up for sale soon lol. 2nd one was a bargain one i found on Mothercare, not been out too long, but at £39.99 for a new pushchair i had to buy it. It is a Be Cool by Jane Street (oyster) and although it isn’t Stokke Scoot, nothing can compare to a Stokke in my eyes. It seems to be not too bad, with pushing Jess round in the house. Have yet to take it out, with being on holiday when it arrived, but this will happen soon, will be giving a review on it once/if i use it enough for a good test drive. So it seems this stroller is my last, ever…. My pramoholicism (made up word?) doesn’t want to be thrown away, but new chapter is a must. Now to find something else to be interested in, shoes and bags just don’t entertain me that much at the moment.. This is the biggest stage of childhood i hate having to deal with. Thomas and Amy weren’t one of those a week and sorted kind. When Jess was 2 it was getting closer to ‘that’ stage. I decided to wait until i thought she understood it all and would be one of those children that it clicked with quickly. When children turn 2, 2 and half people start to think this is potty training time, i did it with Thomas and Amy plus pressure from others saying they should be doing it now, i tried and failed. Just after their 3rd birthdays i done it again and took a few months with Thomas and around a month with Amy, to even just get it and get to the point of a dry day and being confident in them with it. I realised it is like everything else with children and babies they do it when they are ready. Not all children are the same. I had the toilet seat ready which i reviewed last year, click link. It is helped greatly through this stage. We started toilet training on the Tuesday and by Friday it was time to go in our tourer caravan away for Fathers Day weekend. We chanced it and put her in pants. She did fantastic for new environment and being out and about. We had an accident in the car on the way there, she fell asleep on the way so we expected to maybe having to change her when we arrived. Over the weekend we only had 2 more accidents (think excitement took over some thinking of having to go to toilet!) Since the weekend we have had no wee accidents. She is also dry when waking and going to the toilet straight away. So testing the waters with night time training next week if the dry nappies at night continue. I have enjoyed this stage much more this time and glad the last has ended on a good note. My littlest princess is growing up.